As this year marks the centenary of women gaining the vote, it’s appropriate that Uplands Arts’ 2018 Gilbert & Sullivan production is “Iolanthe”. The plot deals with a group of women intervening in the political process to change Parliament for the better : fairies they may be, but they’re a group of feisty women with all the chutzpah of the militant suffragettes. It’s a show that’s often been updated to reflect the current world – as to what Uplands Arts might do with it, you’ll need to visit the Taliesin Arts Centre to find out. The production runs from 26 to 29 September. Tickets (£14) are available from Bernadette Powell on 01792 421261, from society members and from the Taliesin Arts Centre. Last month we ran an article on the upcoming Swansea Festival of Stitch where we said that one of the venues for the exhibition would be the Grand Hotel. This was incorrect, it is the Dragon Hotel. The Mumbles Development Trust and Swansea Round Table are partnering to bring back the Mumbles Oyster Festival on Friday 19 and Saturday 20 October. The 2018 festival, largely funded by Mumbles Community Council, will be held at the Ostreme Centre in Mumbles. All additional information, announcements of entertainment, and most importantly, how you can book your place at this year’s festival, will be released during the days and weeks ahead. If you’d like to register your early interest for this sought-after event, or for further information please contact mdtmumbles@gmail.com. 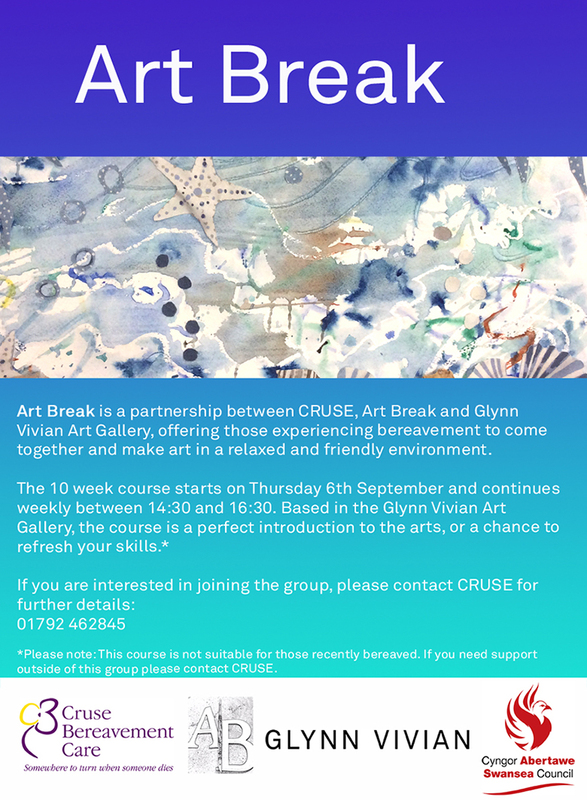 Art break is a partnership between CRUSE, Art Break and the Glynn Vivian Art Gallery, offering those experiencing bereavement the opportunity to come together and make art in a relaxed and friendly environment. The 10 week course starts on Thursday 6 September and continues weekly between 14.30 and 16.30. Based in the Glyn Vivian, the course is a perfect introduction to the arts, or a chance to refresh your skills. Please note that this course is not suitable for those recently bereaved. Radio Tircoed are holding a charity dinner at the Dragon Hotel Swansea on Friday 14 September. The carnival season is in full swing at the moment. There have been some colourful parades right across Swansea Bay. This one took place during a summer long ago, way back in 1967 in fact. Generating much noise and merriment along the route were these members of Swansea West Side All Stars Comedy Band. 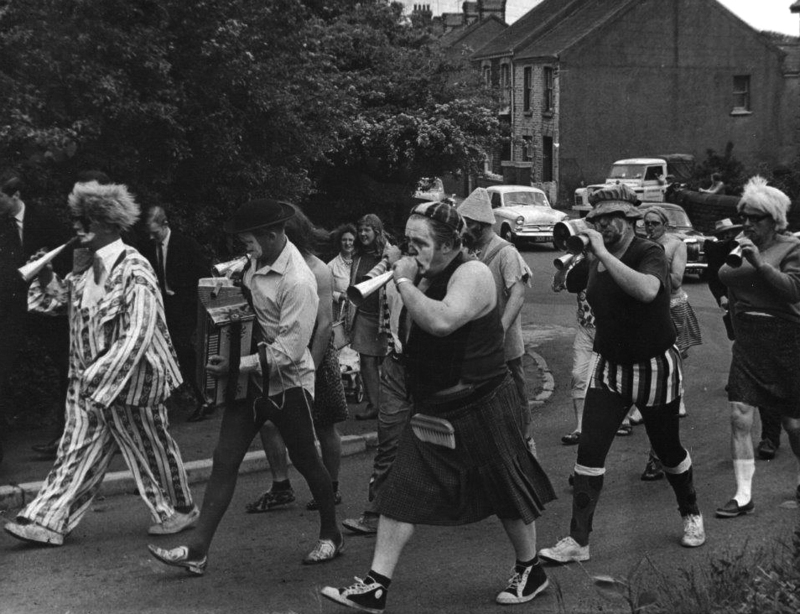 They certainly look a spectacle, and the noise they made would have echoed around the streets, but those who made up the band took it all very seriously. The image is one of more than 300 offered up by Swansea Echoes of the past the most recent and 20th consecutive book by David Roberts. The book captures some fantastic glimpses of Swansea in the past as will the next volume for which David is currently appealing for photos right now. For details on how to obtain a copy visit www.bryngoldbooks.com or phone 01639 643961. Do you have knowledge of, or memorabilia in relation to the men named on the Roll of Honour currently on the side aisle window sill in Clyne chapel? John Powell, local historian, is presenting an illustrated talk entitled ‘The Great War: It’s effect on Blackpill and Mumbles’ in the Vivian Hall on Tuesday 21st August 2018 at 14.00 and he would like anyone who has copies of photos (black and white or colour), medals or memorabilia to get in touch with him. His contact details are as follows; email: johnpowelloystermouth@gmail.com Telephone: 01792 520540. All are welcome to his presentation. The website also includes information concerning the Second World War Memorial and details of those named on Blackpill Roll Of Honour. The main site is named A HISTORY OF MUMBLES which has over four hundred articles concerning local history, memories and Mumbles at War. Bay historian Charles Wilson Watkins has provided us with some information on William Sommers. He seems to have used the name John as well as he is called John William Sommers on his service papers. He was born on 22 April 1900, in Llandrindod, Radnorshire. His father was American, John Sommers and Harriet his mother. His father at the time of the 1911 Census was a Banker in a Colliery, living at Mill Lane, Blackpill, where they had been since 1908. War broke out in 1914, and the gardener’s assistant William enlists during 1915, and serves with the Royal Navy. William’s personal particulars on his service papers are: Height 5ft 1½ins, Chest 31½ins, Hair Light, Eyes Blue and Complexion Fair. Entry from the Royal Navy Registers of Seamen’s Service, 1848 – 1939, states from October 1915 to March 1916 William, Boy Class II served on H.M.S. Impregnable, then Boy Class I; on H.M.S. Victory till April 1916; H.M.S. Prince of Wales till November 1916; H.M.S. Egmont till February 1917; H.M.S. Vivid till March 1917; Auxiliary till June 1917; H.M.S. Vivid I till June 1917; H.M.S. Iris till July 1918, when he is ranked as Ordinary Seaman; H.M.S. Vivid I till November 1918; H.M.S. Iris till February 1919 and finally H.M.S. Vivid I till May 1919, when he was invalided from the Navy due to Tuberculosis. John William returned home to Neath, where he died during September 1919 aged just 19. His name was added to the memorial which was unveiled in 1922. What about the rest of his siblings? The new Swansea History Journal (Minerva) will be launched and a new book on cricket in Swansea will be available – just pop in for those, or come for one of the talks, or all of them! It’s free, but come early to be sure of a place. 10.05 Launch of Swansea History Journal/ Minerva, Volume 26. Dr. Richard Wood is the author of “Miners at War 1914-1919”. This period, including the role of women during “the Great War”, is his speciality. The new museum manager is full of energy and enthusiasm and will outline the improvements currently being made. The Archivist of Glamorgan CCC, Andrew also manages the Museum of Welsh Cricket at Sophia Gardens. The author of more than thirty books he will have copies of his latest, on Swansea cricket. Beyond nostalgia! The second volume of his “Swansea & its History”, entitled “The Riverside Town” is due out soon. Refreshments will be provided by the RI Social Committee in Swansea Museum, and the Waterfront café is open until 16.30. Richard Jones (1781) who owned about a third of Swansea. 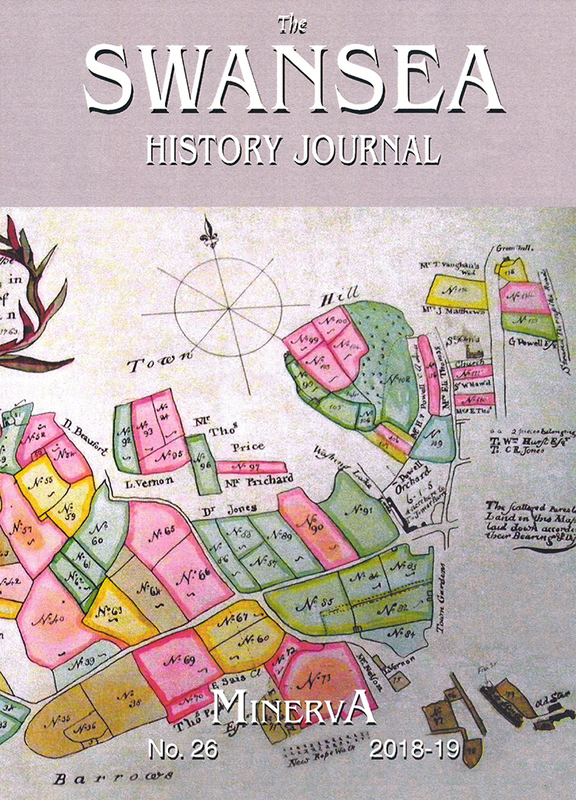 The ‘Gemau Byrrach’ section of the journal has 27 pages of briefer gems. Come and meet authors, publishers, dealers…local history groups…the Gower Society, Industrial Archaeology Society, South Wales Records Society…West Glam Archives, the Penllergaer Trust. Free entry. Homemade refreshments. Historical mini talks throughout the day. Come and meet knowledgeable people in a friendly atmosphere. As well as the return of your favourite orchid nurseries, there will also be stalls selling carnivorous plants, orchid companion plants, botanical paintings and other works of art, as well as orchid and general plant books. 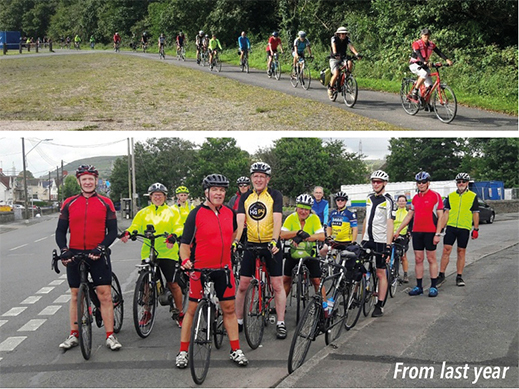 Taking place from 18 August to 25 August the 9th Gower Cycling Festival features 22 rides over 8 days except one of the rides isn’t a ride but a party! Most rides start from the Dunvant RFC where camping will also be available. The rides range from gentle, through to moderate and then relatively challenging. The grading is based on a combination of hilliness and distance.